N.F. Ramsey, Thermal Beam Sources. M.D. Morse, Supersonic Beam Sources. A. Chutjian and O.J. Orient, Fast Beam Sources. C.R. Vidal, Vapor Cells and Heat Pipes. K.M. Evenson and J.M. Brown, Free Radical Sources. T.J. Gay, Sources of Metastable Atoms and Molecules. T.F. Gallagher, Production of Rydberg Atoms. C.C. Bradley and R.G. Hulet, Laser Cooling and Trapping of Neural Atoms. J.J. McClelland, Optical State-Preparation ofAtoms. G.S. Hurst and J.E. Parks, Methods and Applications of Resonance Ionization Spectroscopy. H. Hotop, Detection of Metastable Atoms and Molecules. J.E. Lawler and T.R. O'Brian, Excited Level Lifetime Measurements. J.C. Bergquist, Doppler-Free Spectroscopy. R.D. Suenram and A.M. Andrews, Microwave Spectroscopy. L. Young, Fast Beam Spectroscopy. T.F. Gallagher, Quantum-Beat, Level-Crossing, and Anticrossing Spectroscopy. O.H. Carnal and J. Mlynek, Atom Interferometry. J. Bland-Hawthorn and G. Cecil, Classical Spectroscopy. C. Kittrell, Pulsed Laser Raman Spectroscopy of Dynamic Systems. Chapter References. Subject Index. 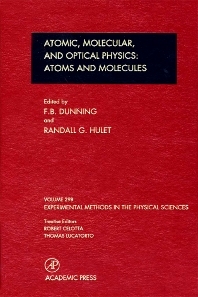 Combined with the other two volumes, this text is a comprehensive treatment of the key experimental methods of atomic, molecular, and optical physics, as well as an excellent experimental handbook for the field. Thewide availability of tunable lasers in the past several years has revolutionized the field and lead to the introduction of many new experimental methods that are covered in these volumes. Traditional methods are also included to ensure that the volumes will be a complete reference source for the field. Researchers in atomic, molecular, and optical physics; advanced graduate students; chemical physicists; physical and analytical chemists; and surface scientists, including chemists, materials scientists, and physicists.